Top 6 Facts About Machu Picchu. 1. First to get to start The Machu Picchu Trail you first have to get to the village called Aguas Caliente before riding transportation up a steep, switch back road. This is where you will get the first glimpse of Machu Picchu from an elevated viewpoint which is what trekking pilgrims would have seen nearly five centuries ago. 2. Daily visitors are limited to 2,500 per day, although at times it may seem like more than that. The crowds usually start to build up in the late morning and early to mid afternoon. This leaves the much quieter times at either end of the day when the light is at it’s best for taking photographs. 3. The best time to go is from April to late October after which the low clouds and driving reain usually obscure the site. 4. 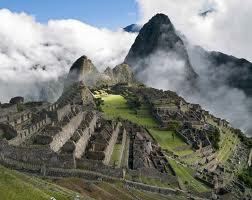 Machu Picchu was only fairly recently discovered. Back in the early 1900’s the place would have been shrouded by a wall of centuries old vegetation, from which peaked glimpses of stone walls. The American explorer Hiram Bingham discovered the site after it faded into obscurity in the mid 1500,s. The once powerful Inca civilization had been scattered by the Spanish conquerors and with their demise faded away the memories of Machu Picchu. The city was once a home for kings, knobles and priests. This was a sacred place requiring permission to visit. There is now a small, discreet hotel called the Machu Pichhu Sanctuary Lodge which is the only lodging close to the site. Most visitors stay below in the village, or even further away in Cusco. If they do this they can choose to ride the daily luxury Hiram Bingham tran to Aguas Caliente or take one of the more basic trains to the town before getting to Machu Pichhu. 6. The 2,450 metre height of the ruins can cause shortness of breath and elevated heart rates. The effects can be worse in Cuzco which is the closest big city. At 3,300 metres, when exiting the aircraft many passemgers experience dissyness and shorness of breath. Some people prepare for this by taking medications such as Advil to open up the blood vessels and fight headaches. Other treatmens include prescription drugs such as Diamox.The airport staff at Cuzco are well used to dealing with these types of issues and have instant remedies on hand.